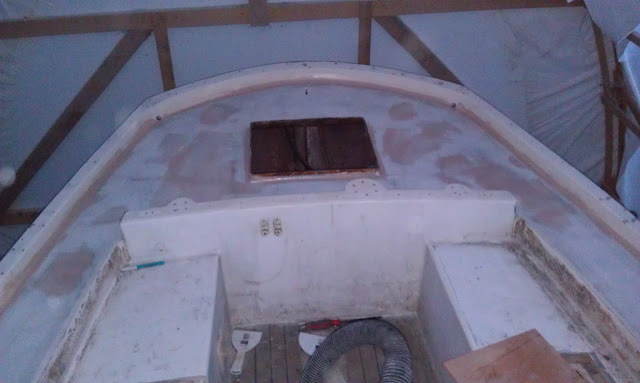 It's been a busy week with non-boat related activities but I finally managed to get the decks around the cockpit primed. 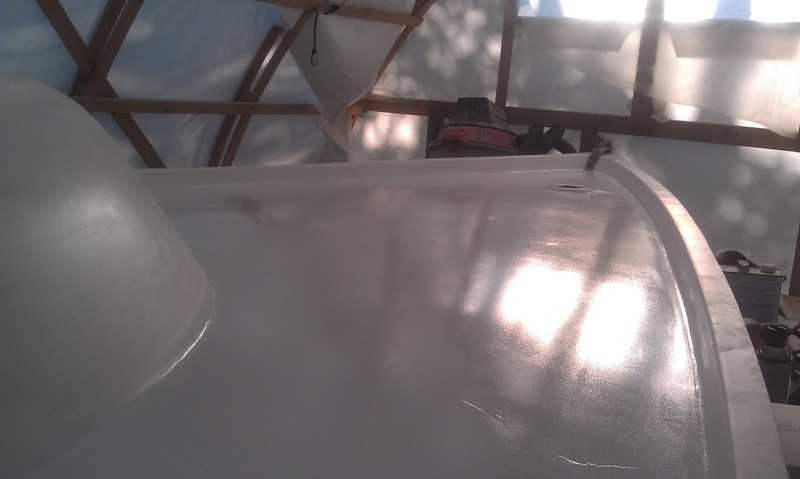 At the same time, I was able to get a second coat on the sides of the cabintop and any of the areas on the cabintop that were faired with Quickfair. Of course it was pretty late by the time I finished and the light was definitely bad so I'm surprised it came out as well as it did. I think I've said before that I do not like painting mainly because I never have very good results. Well, I seem to have found a way to make it look better and it is totally opposite of the way your supposed to do it, so I'm not sure how this will look once the final painting is said and done. 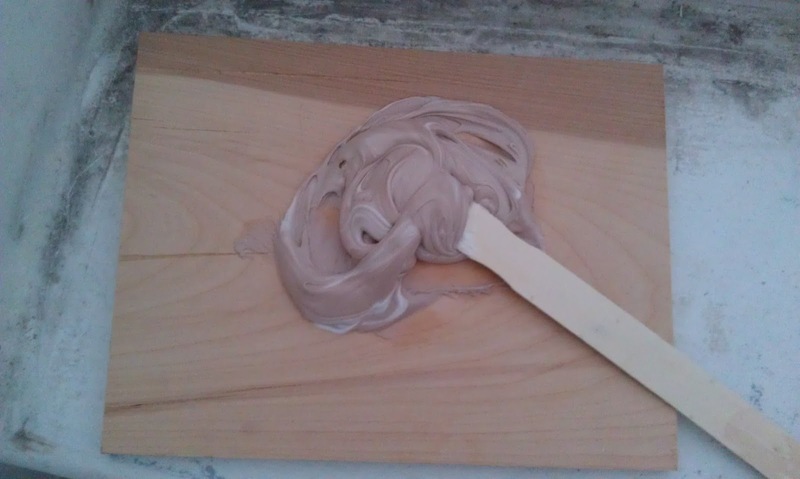 The way I did it last night (with good results) is to dip a brush into the paint and then roll it out. It removes the brush strokes that I can never seem to get rid of (especially when I'm attempting to tip it out) and smooths the paint to a uniform texture (yes, probably known as orange peel). Maybe I'll get refined by the time I get to the top coats (which are getting pretty close now). I still have to tackle the cockpit priming and the perimeter where I faired along the bulwark and the chainplate covers but the list is getting smaller now. Woo-Freaking-Hoo! I feel like I'm now at a point of diminishing returns when it comes to sanding. The decks aren't perfect, but I'm going to go out on a limb and say they are 'close to good enough'. There are 2 notable exceptions to this rule though, the first being the cockpit, and the second is a small section where the QuickFair just doesn't want to cure. Bad cure make Matt mad! On a brighter note, I am making progress in the cockpit. 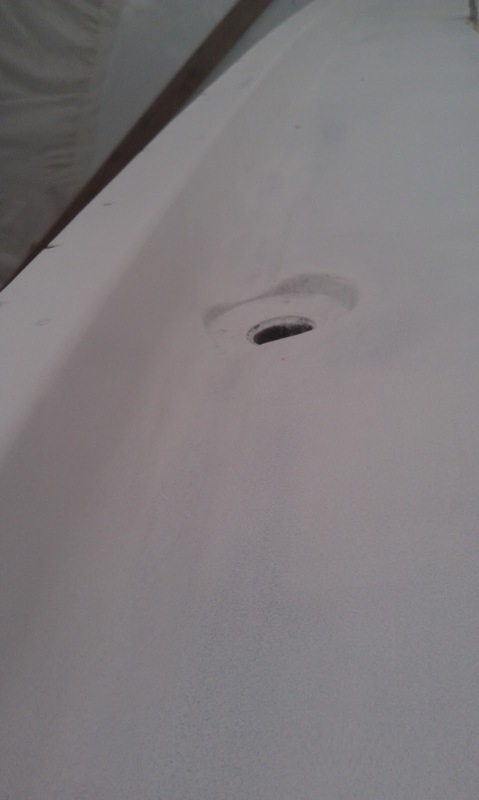 The instrument hole patches cured up nicely and I did 2 coats of QuickFair (I like the 3 hour sand time). The last one looks good and I think it will be all I need at least until I prime and can really see any imperfections. 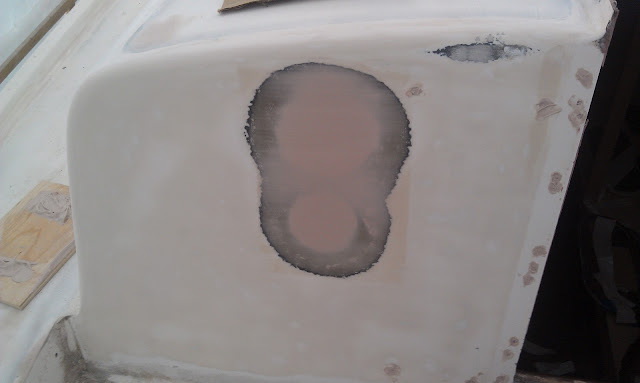 I also started sanding the cockpit seats but the paint on there is tough stuff, the sander is not making much of a dent. 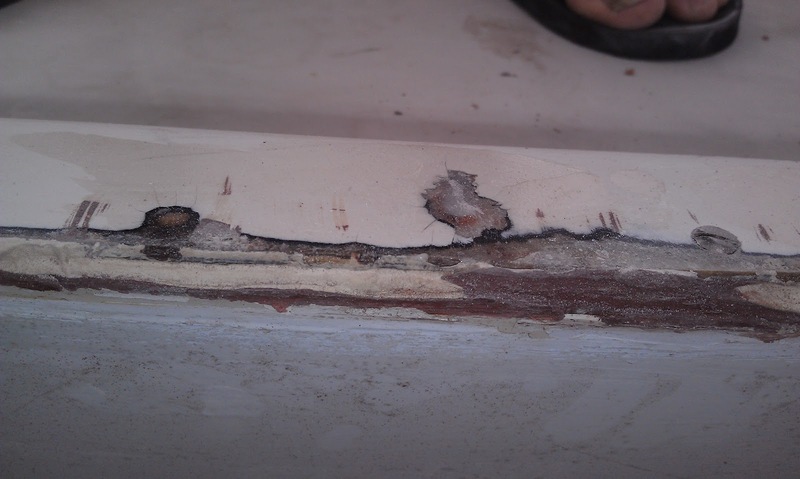 It's odd because I know that paint is an enamel because I did it about 8 years ago, but the sanding is going similar situation to what I found on the forward cabintop. I ended up priming over that and it looks fine, but the PrimeKote specifically says that it shouldn't be applied over enamels. I have an old tub of 'Peel Away' stripper that I will probably try to use over the next few days. Hopefully that will do the trick. Another decision I will need to make in the cockpit is the teak deck on the sole that I partially ripped up when I first started this project a few years ago. 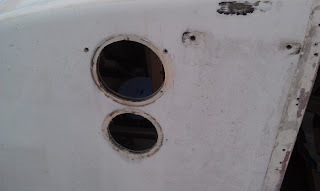 I had planned on going back to tiller steering (and may still do so), but I found that the rudder shaft had been cut off so I would have to replace the shaft (and likely the entire rudder), fabricate a new tiller head, and build a deck/shaft interface. Along with that I would need to remove the pedestal and quadrants and who knows what else. It's a ton of work, and I know I would feel better if I just did it. Safety issue - If the steering cable(s) jumped the quadrant I would be screwed. More room in the cockpit. Better feel - I like the direct feel of the tiller; lots of feedback. A shitload of work and money. Could delay launch even longer. I keep telling myself that I can make that decision later, but later is approaching and I'll have to make up my mind soon. Seems like that's all I do these days, not that I'm complaining. It's way better than a lot of tasks I've done over the course of the recore, but it's getting old now. I know there's lots more to come, but the vast majority during the past week has been in the corners and small curves of the bulwark or cabintop interface with the deck. My finger tips are sore and cut up from all the abrasives I've subjected them to. I did get quite a bit done and am now getting blinded by the light at the end of the tunnel. I used a bunch more QuickFair to set up a nice radius for the entire deck/bulwark and deck/cabintop interface. Using my finger again, I ran a filet around everything and then sanded it all back down so it was nice and smooth. All told, I laid and sanded about 105 feet of filet over the past few days. The QuickFair sands really well by hand, but I broke out my old Porter-Cable Profile sander to rough in the radius before I went over it by hand. 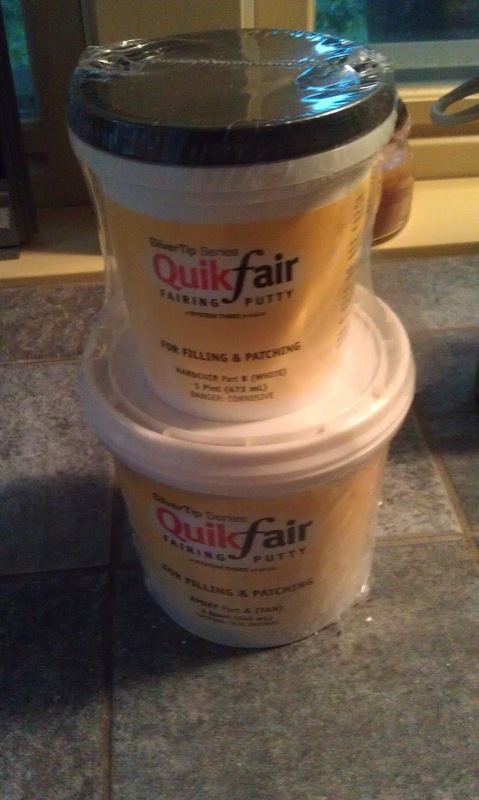 Makes quick work of the QuickFair. Not everything went perfectly though, I got sloppy when I was laying down the last of the filet. I didn't want to have to mix a new batch because I only had about 2 feet left, so I really scraped the mixing board and laid it down, but that 2 foot section never cured properly. It was the dregs of the batch and must not have had enough hardener to make it kick. After 2 days I gave up and scraped it all off, solvent washed the area down and ran a new filet. Not a big deal, but it was another 20 minutes of my life I'll never get back. Is that all I did? I also filled any high spots that I could find on the decks but there just wasn't that much to do. 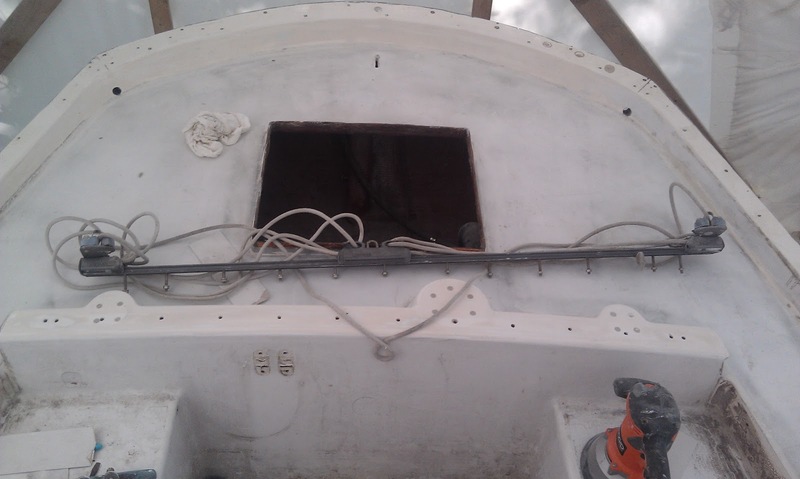 One spot on the foredeck and a few spots on the cabintop. Once I sanded everything back down, there wasn't much to see other than a few pinkish spots around the deck. 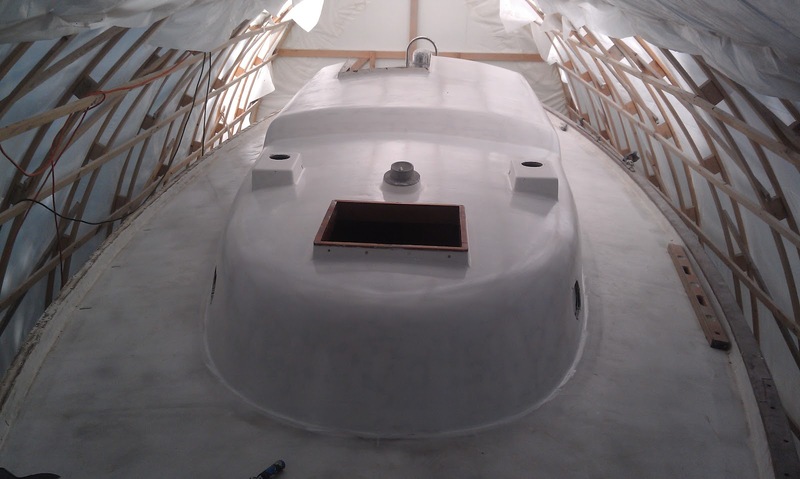 I've decided to put down the second primer coat until I prep the cockpit and get the first primer coat there and on the aft deck. Today I focused on getting the cockpit ready; there is a lot to do. I finally pulled the old instruments off and managed to do so without inventing new swear words to impress the kids with. They really weren't mounted very securely as it turns out and it didn't take much to get them out. In fact the old loran unit (yes, high tech stuff) was only held on by some sort of white putty. I'm not sure what it was but all I had to do was jam a flathead screw driver between the plastic plate and the bulkhead and it popped right off. 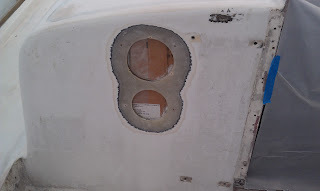 The other instruments came off almost as easy, but at least they had a retaining ring around the back. Once the depth, speed, and loran were yanked, I got to work grinding a 12:1 bevel for the new glass to stick to. 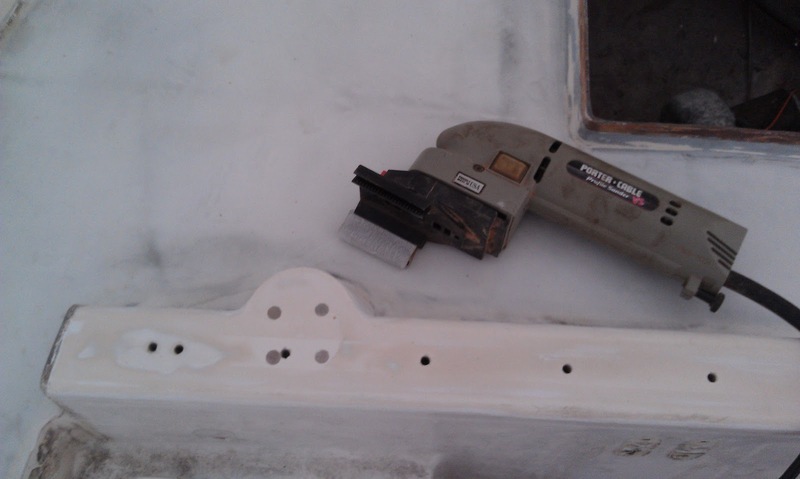 When doing the main decks I resorted to the angle grinder because it went so much faster, but I elected to use the 6" Rigid sander with dust collection to avoid the misery that I faced when I put bevels in all the decks. A lot slower, but it was such a small area that it was worth not throwing a ton of dust everywhere. 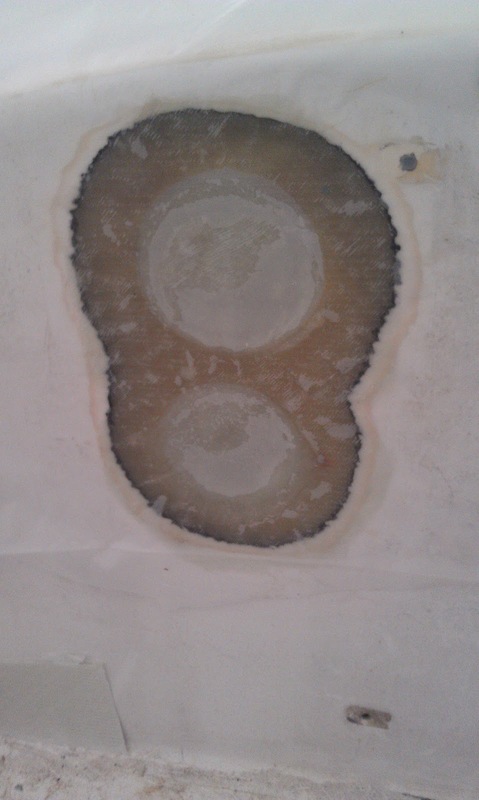 After that I cut out 5 layers of biaxial cloth and pre-fit them into each of the holes and inserted a cardboard backing plate lined with plastic to keep the epoxy from sticking. Finally I mixed up a 12 oz batch (mental note: I mixed way too much for that small job), and wet everything out and slapped the layers in (largest first then small going out). Once satisfied with the way the cloth was laying down, I covered everything in plastic, smoothed it out as best I could and called it a day. Tomorrow, I'll clean it up and possible add a fairing coat on. This week was just too hot to get much done after coming home from my real job so I wasn't able to complete any single task until today. Fortunately, it was a bit cooler today and I was able to knock a bunch of things of the list. I don't know why I didn't do this years ago when I first started (yep, it's been years now), but I finally tackled the removal of the mainsheet traveler. When I pulled all the hardware off the decks way back in January of some distant past year, I think I assumed that the traveler would be a bear to tackle and just left it because it wasn't really in the way and I didn't plan on doing anything to it. It became clear the other night as I was beginning to sand around the base that it would have to come off for paint or the job would look sloppy. So armed with my best contortionist posture and a 10mm socket I hung myself upside down in the rear hatch. It turned out to be really easy though and I had it off in less than 20 minutes and I didn't loose a single nut to the ever hungry bilge monster. 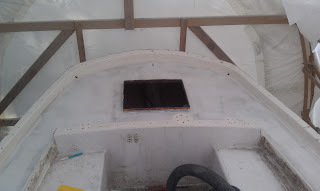 With that out of the way I was able to finish up sanding around that section and the rest of the bulwark/deck interface as well as the interface around the rear hatch. 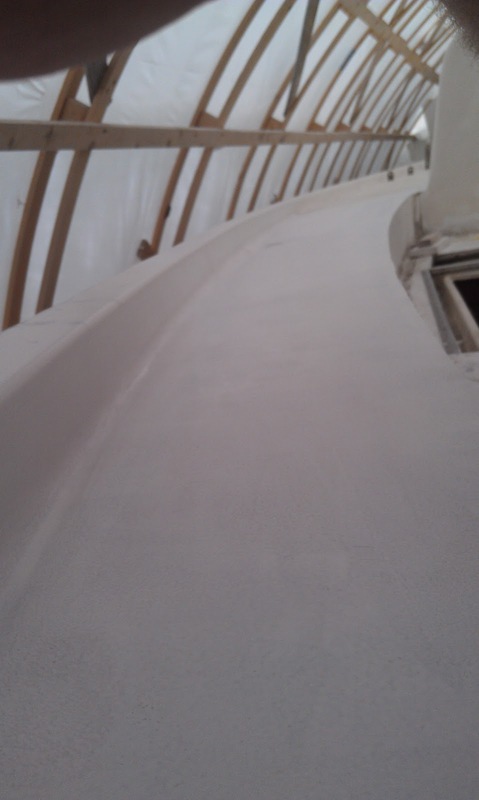 There are lots of weird corners and curves that need to be sanded here so it took a fair amount of time. Then I moved on and hit the top of the bulwark where I had filled all the holes for the old caprail. I know the picture below looks pretty much the same as the first one, but it is a lot smoother. By this time is was getting late but I decided to throw down some System Three QuickFair around the edges and a few low spots. 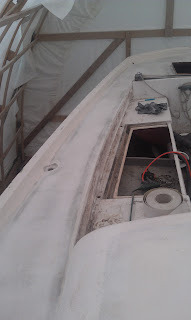 As well as I had sanded the bulwark/deck interface, there was still a little roughness to the touch and I had heard good things about QuickFair. 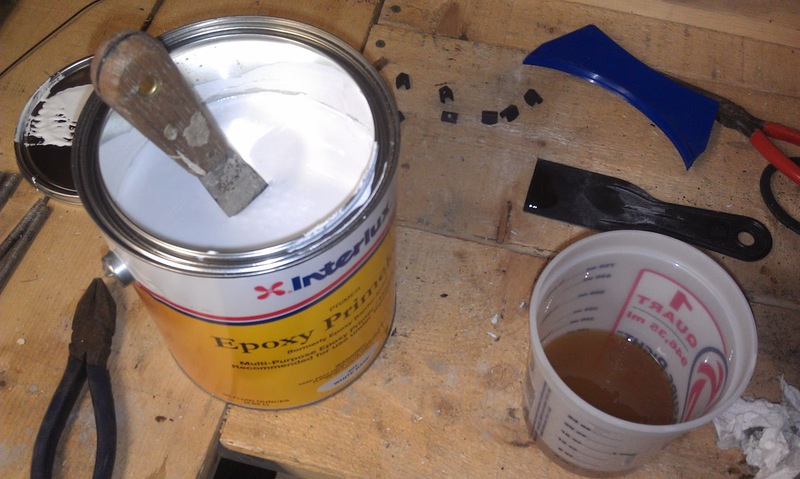 It's a light 2 part epoxy fairing compound that you mix up on a board (2:1 ratio) and spread it on. System Three touts that it is sandable in as little as 3 hours so you can get a lot done without the usual multi-day wait time. 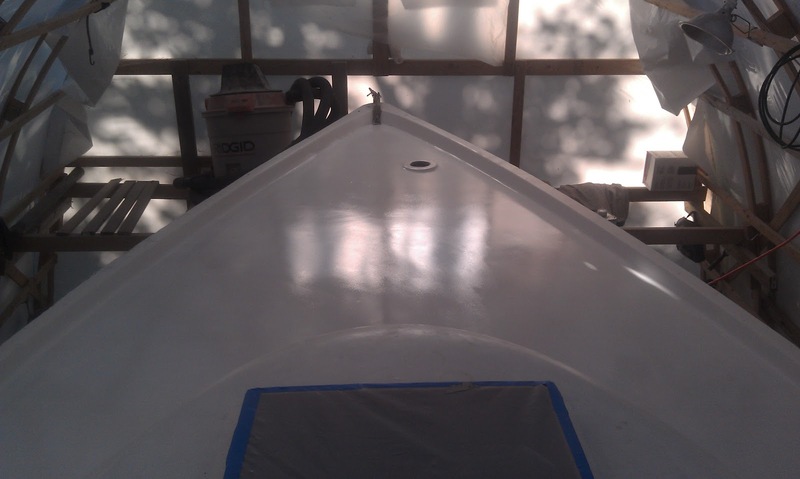 Anyway, after wiping the whole aft deck down, I mixed up about a 1/2 cup total on a board and started spreading. I like it, it is REALLY smooth and spreads very evenly. I think if I had to do this whole thing over again and I had lots more money (it isn't cheap), I would do more of the fairing with this stuff. I finished up just as it was getting dark and think I got most of the low spots and ran a full bead around the perimeter at the bulwark/deck interface. I started out with a spreader cut to the approximate radius of the corner, but ended up using my finger for most of it. It just seemed to work better that way. I should have worn gloves, but by the time I was deep into it I didn't want to risk having the stuff kick while I was down below gloving up. Hopefully it will sand as well as they say it will; I'll be at it tomorrow. The temperature in Concord was 95 today and the humidity was approaching jungle levels today so I knew what little time spent in the boatshed this afternoon would not be remotely pleasant. As usual, the afternoon sun coupled with the fun effect that makes hot air rise made for a pretty nice sauna on the decks of magic today. All that was missing to complete the experience was a bucket of water with a ladle to pour onto some hot coals. 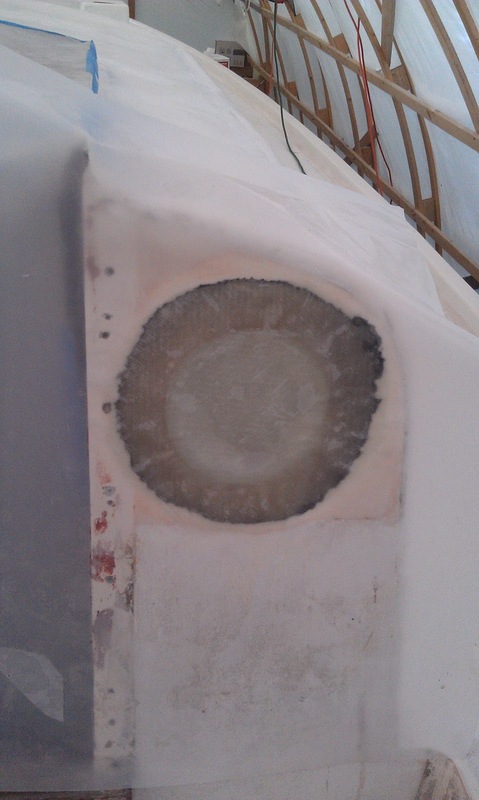 I did manage to last through a full hour of sanding the decks both adjacent and aft of the cockpit, but by the end my respirator had actually accumulated a pool of sweat in it that would roll around when I leaned forward. Good times indeed! 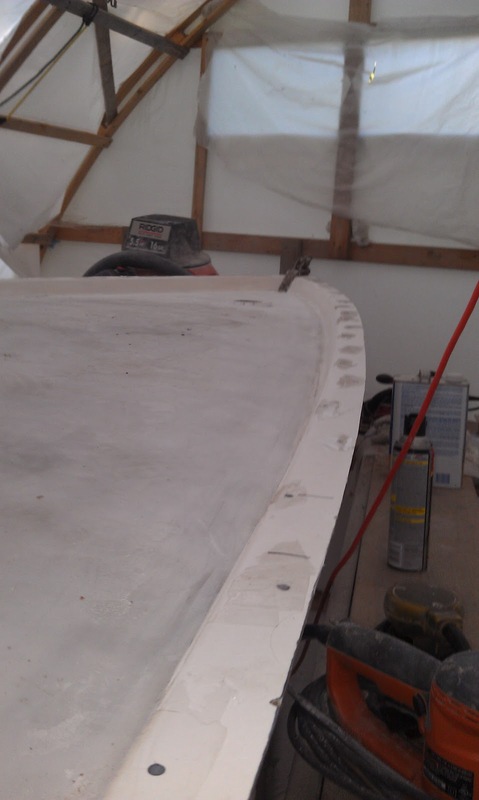 These sections of the deck will take the most time because there are a lot of curves to fair and each side has a scupper with a small trough that runs along the outboard side of the each side deck for several feet before leveling out. Getting these fair will be critical to the final appearance, so I'm planning on spending a good amount of time trying to get them near perfect. I'll be doing another small fairing coat with System Three QuickFair once I have everything roughly faired before I even think about primer. 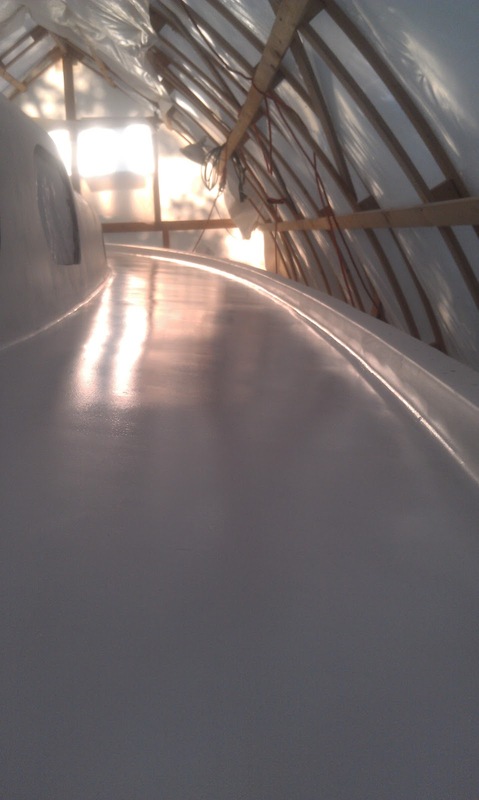 The nice thing about QuickFair other than the thickening filler has already been added so you don't have to mess with microspheres and aerosil is that it can be sanded after only 3 hours. 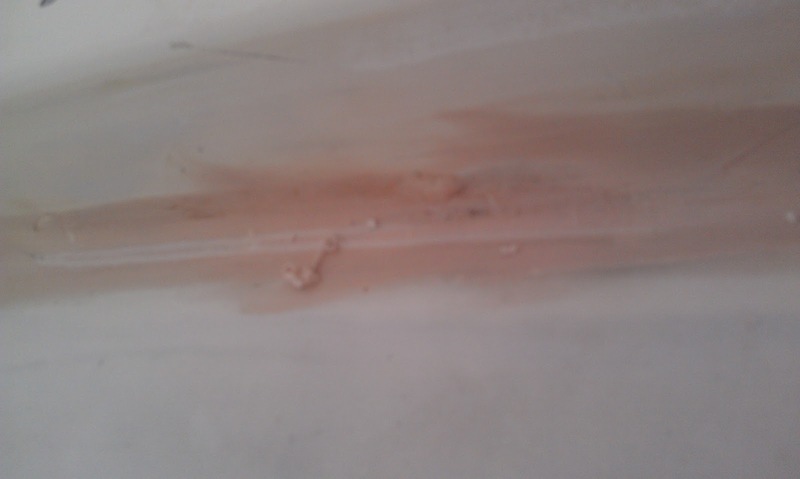 That means that I can potentially get heat stroke three times in one day instead of just once with my current epoxy. Once primed this section of deck should be in good shape and may not need any more fairing (hopefully) before the second coat of primer. Then it's onto the cockpit itself... I hope that I can just get away with sanding it down with the exception of the instruments that I need to remove (old depth sounder, knot meter, and yes a Loran). I'll have to reglass those areas unless some benevolent soul decides to send me new instruments to take their place (there's always hope). Not that I wasn't making progress before, but now it feels like I'm really rolling. 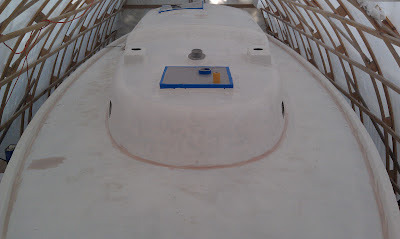 I was finally able to lay down the first coat of Primekote epoxy primer on the decks forward of the cockpit this weekend. I'd been putting it off for a few weeks now because I always managed to find another area to sand, but I finally said enough and went to it. 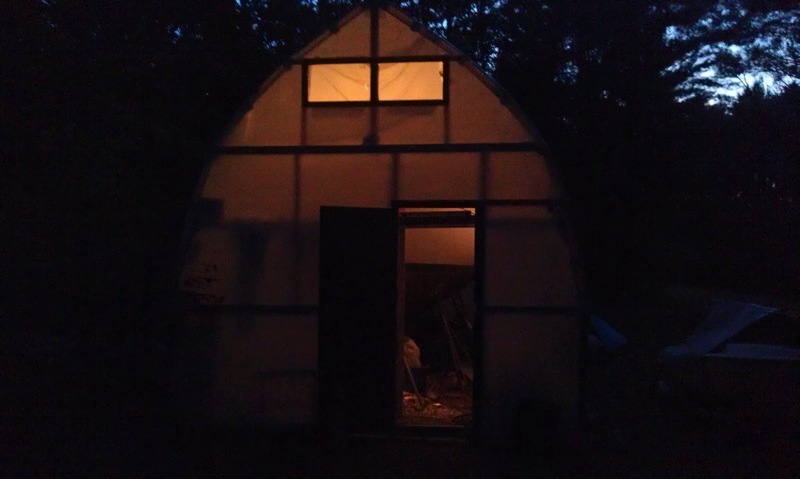 The temps this week have been nasty for New Hampshire; mid 90's and humid so I decided to do the job as early as possible so I could get out of the boatshed before it turned into a furnace. Even if I could take the ridiculous temperatures in the shed anytime after 10 am, the sweat that literally pours off me would certainly ruin any finish so I started at 5 am, just after sunrise. I did it in 2 parts, the first morning I painted the bulkwark sides and top (under where the caprail will go). I used a 2" high density foam roller that was a perfect fit for the job. First I wiped down the entire bulwark forward of the cockpit with 2333N brushing thinner and then mixed up 10oz total of the Primekote. Then I rolled and tipped it off starting at the bow and then working back on each rail. All told (with the 20 minute induction time) it took about 2 hours. Everything went according to plan and I didn't sit in any paint or dump the bucket in my lap (this has happened to me before). I left for the day and let it bake. At 5 am this morning I set out to tackle the fore deck and side decks forward of the cockpit. Same procedure as the day before but a bigger area and more paint (25oz total including 20% 2333N brushing thinner). Everything went well with job as well, but I needed to change out the roller half way through because it was showing signs of coming apart. This time I used a 7" high density roller though. The only other glitch was that toward the end I was running very low on paint and had to stretch the last few feet (I worked from the starboard aft side forward, onto the fore deck, and then down the port side working aft). I'm really happy with the results. There were no surprises as far as unexpected 'un-fair' areas. 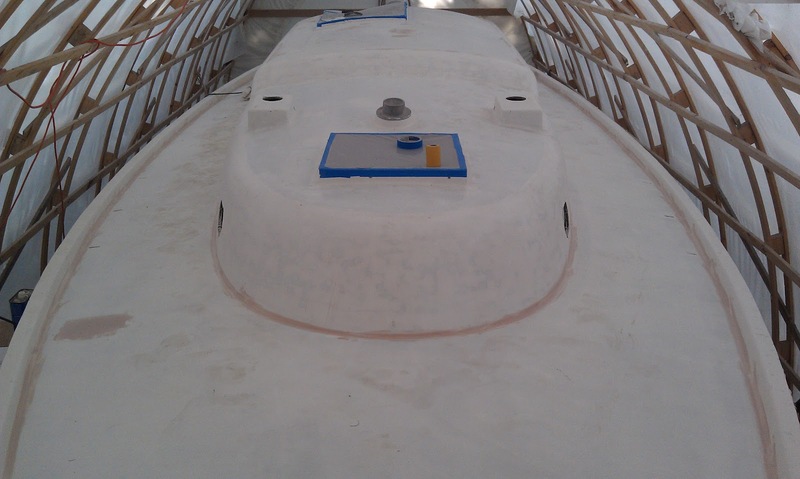 There are a few areas that still need a bit of additional fairing, but I knew that going into priming. 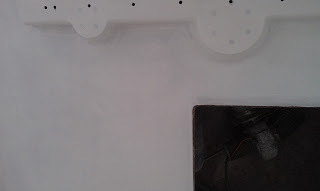 I wanted to get a more uniform color on the decks so I could better see some of the areas that were still a bit lumpy. I ordered a 1.5 quart kit of System Three Quickfair for this purpose. It should be here sometime midweek. Once that arrives I'll be able to do a final spot treatment for any undesirable areas left on the fore and side decks. In the meantime I get to get started on the cockpit area aft. Lots to do in the cockpit and a bit more fairing on the aft deck and areas adjacent to the cockpit. I have no shortage of work ahead of me, but this was a big milestone. Very shiny and still wet. I had to jump off the back of the boat to exit. In the lower right side of the photo, you can see an area that will need some additional fairing. Not a great shot, but it all looks pretty clean at least. Not too bad but yet another thing that has to get put on the list of 'to-dos'. 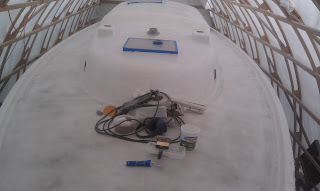 After getting the first primer coat on the cabintop I moved onto getting the decks ready for primer. I sanded the side decks back to the cockpit and then decided that it was time to remove the port caprail. I had been putting it off because until now it wasn't in the way, but I'm actually getting close to painting this beast so I got to it. Like the starboard side, I had to use a hacksaw to cut the 5 inch bolts holding on the genoa track. Time consuming and mind numbing, but not difficult. After that I needed to do the same to the for and aft chocks; again, not hard, just tedious. Finally I moved onto the 50 or so screws holding the caprail onto the bulwark. For some reason, I actually enjoyed this task. I have to use a chisel to split the wood bung covering the screw, and then use my big screwdriver to back it out. Not one gave me a problem and even though it took over an hour, I felt like progress is progress. Every screw I remove is one less I'll need to do later. Finally it came time to get the caprail off. 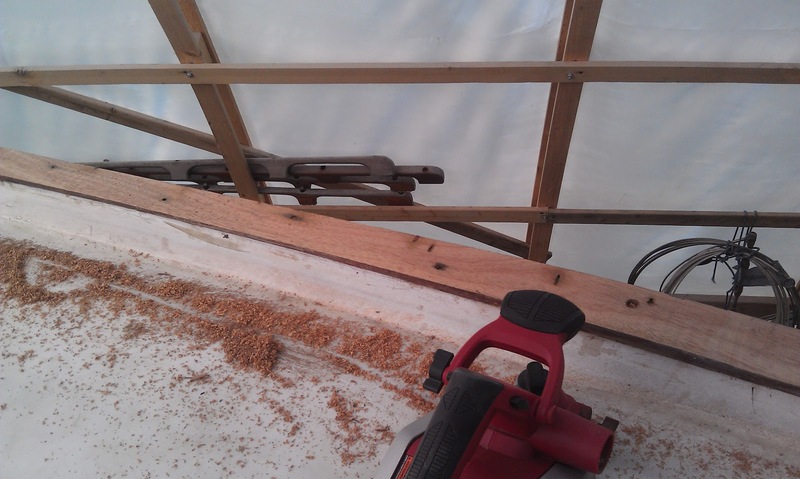 Using my japenese pull saw, I cut it into 3 sections and started to pry it up. 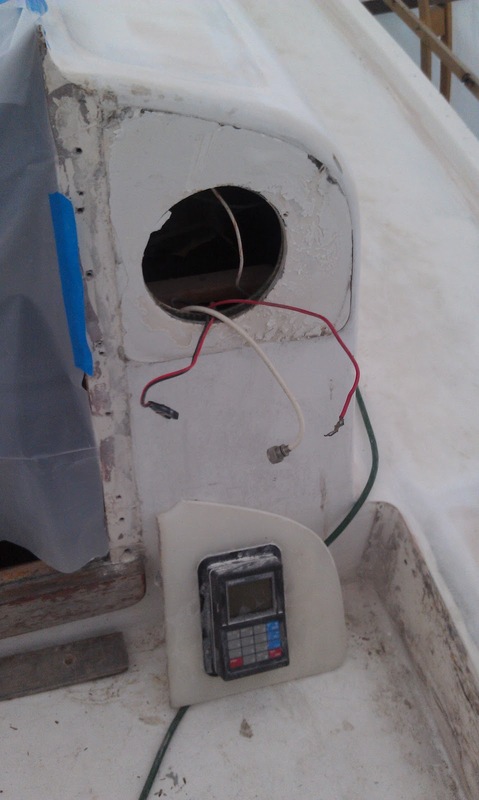 On the starboard side, it took a little bit of force to loosen it up, but once it broke free it was a breeze. Unfortunately, the forward 10 feet wouldn't budge on the port side. 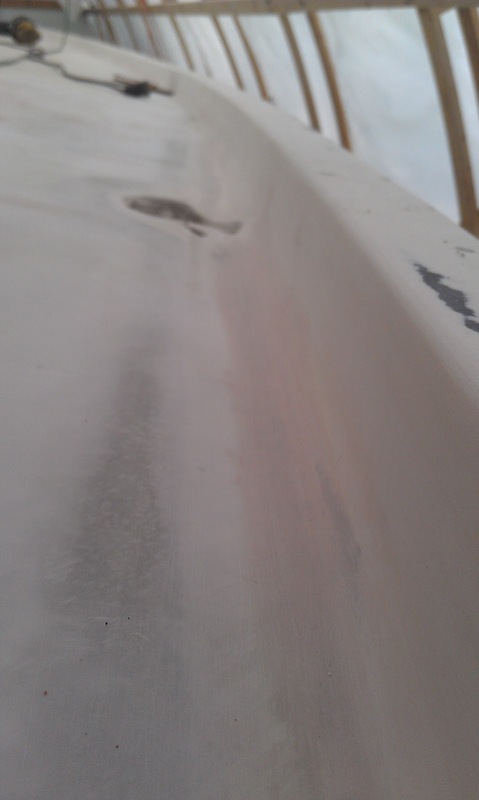 I tried chisels, screwdrivers, hammers, etc... but the only thing I succeeded in doing was actually pulling the gelcoat off the bulwark where it did finally give way. Upon closer inspection from the outboard side, I could see some mahogany colored 5200 (or something of that ilk) under the rail and extending down over the hull-deck joint. Not good. It looked as if there was some previous damage done to the boat that necessitated a goopy patch over the hull-deck joint and under the caprail. I couldn't tell the extent of damage until I got the caprail off but I couldn't get it off... what to do? I finally resorted to using my power planer and decided to just turn the whole section into wood chips. It only took about 10 minutes to buzz the whole section off and I made the whole boat shed smell like fresh cut wood. Mmmmm! What I found underneath was a bit perplexing. It's hard to tell if there was previous damage to the area. The top of the bulwark is a bit banged up but that could have been caused by me trying to pull the caprail off and the tenacity of the 5200 pulled up the glass in that area. However, the laminate thickness of the bulwark in that section is really thin (~3/16" instead of 1/2" on rest of bulwark). 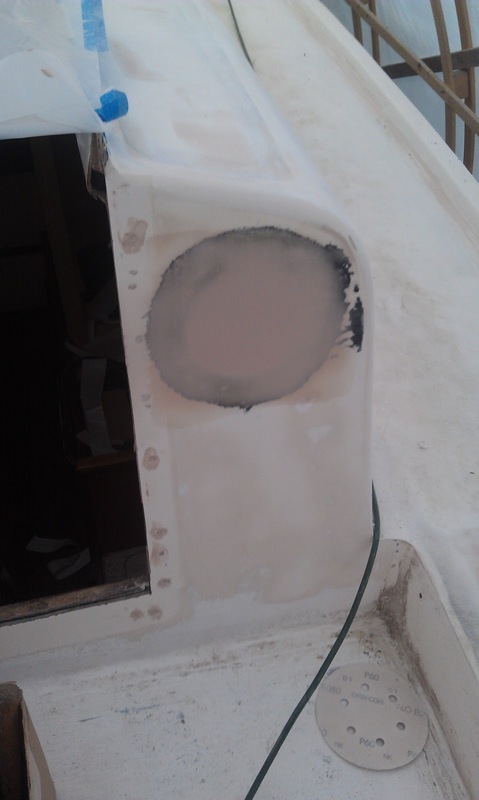 It may be that the original layup was not good in that section and the builders 'fixed' it by putting a few stainless sheet metal screws into the bulwark and injecting a crap load of 5200 into the area to keep the joint intact. Or maybe it's a combination of the 2; the thinner laminate was weaker and if the boat was in some sort of collision it popped the hull-deck joint and somebody repaired it. In any event, it's not anything I can't fix, but it will take time. My plan is to clean up the joint as well as I can and inject epoxy into the bulwark void to tie the joint together. Another thing to do; Oh well. Once I got past that let down, I sanded the top of the entire bulwark around the boat and filled all the screw holes with thickened epoxy. Once it cures, I'll sand it down and it should be ready for a coat of primer (after I do the epoxy injection of course). Getting to the actual task of painting (or priming in my case) seems like I am firmly part of the children's book by Laura Numeroff. I start on one small task and it leads to another, and another, and another, until I am so far away from the original task that it makes my head spin. So when I walked over to the boatshed this morning thinking I'd have the cabintop primed by 9:00 I should have known better. When I started, I was going to mix up the paint right away and use the 20 minute induction time to wipe down the cabintop. Instead, I decided that I'd give a quick once over with the 100 grit to make sure everything was perfect. Well, that led to me finding some silicon that was still on the window frames so I had to dig out a razor to cut it off and then sand that down. 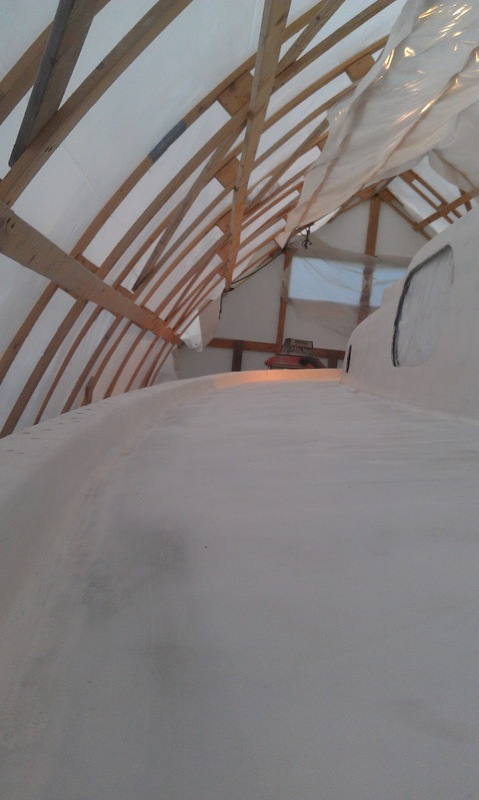 Then I decided that I would re-sand the area where the deck meets the cabintop to make sure that was smooth. In the end I spent 2.5 hours doing prep work that I thought was already done. Oh well. When it came time to mix up the Primekote things up it went pretty smoothly though. I had practiced on the dinghy the day before to get a feel for how this stuff behaves. I decided to use the same amount I used on the dinghy to make things easy. I had a fair amount left over when I finished the dinghy and I thought it would be about the right amount for the cabintop. 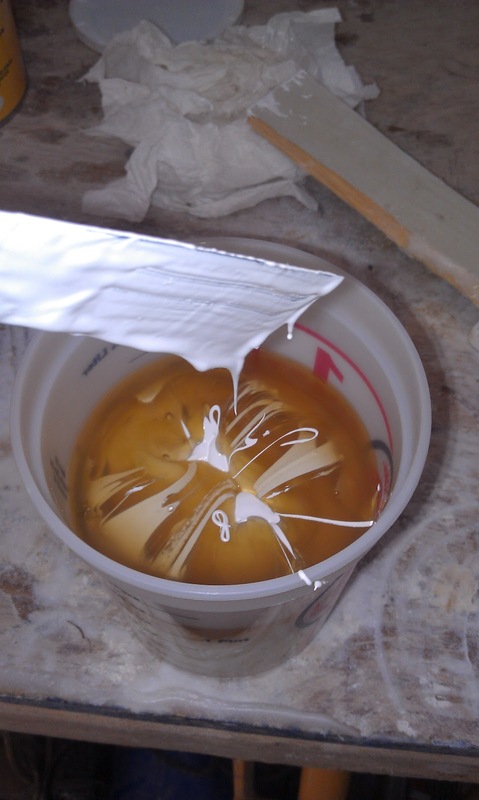 Measuring this stuff by volume is a bit dicey since the paint part is like putty, so I poured 5 oz of catalyst (liquid) into a quart container and then glopped (technical term) in the paint part until the total volume was at 20 oz (3:1 ratio). Then I mixed it up and let it stew for 20 minutes (induction time) while I wiped the top down with 2333N. I should note that Interlux recommends using Solvent Wash 202 for the wipe down, but I didn't have any and based on many other's accounts, I went with the 2333N. It has many of the same ingredients according to the MSDS sheet and its only purpose is to get any remaining dust/debris/wax off the area to be painted. After the 20 minute induction period was up and I had wiped everything down, I added 5 oz of 2333N Brushing Thinner, mixed it to an even consistency. I started on the top aft section of the cabintop and worked my way aft on top. I'd pour a bit out and then roller it in all directions spreading it evenly in roughly a 2x2 foot area. Once satisfied that it was uniform, I tipped it out with a brush to knock down any bubbles that may have formed while rolling it out. One thing I forgot to do before starting was to tape off the mahogany trim on the hatch opening. I ended up getting a bunch of paint on it and will need to sand it all off and re-varnish (eventually). Once I finished up with the top sections I poured the remaining paint into a roller tray and loaded the roller in the tray to do the side sections. I used a 7" high density foam roller from Lowes for all the work today. 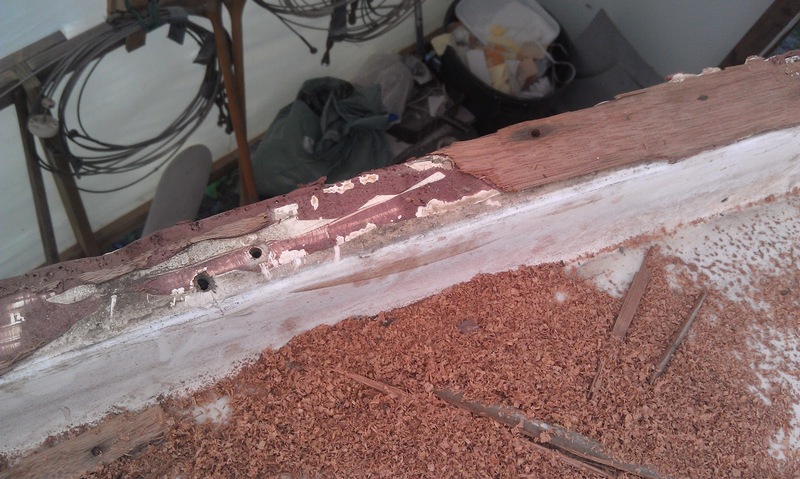 One thing I learned yesterday from the dinghy project is that not all marine grade rollers work very well. 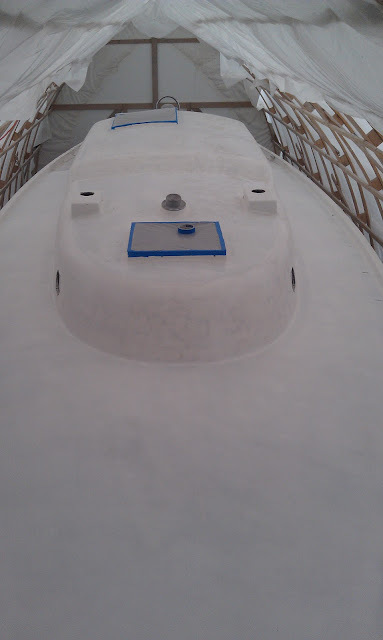 The one I had for the dinghy (Seachoice High Density) fell apart long before I was finished and I had to do the last sections with a brush only. The cheapo's from Lowes worked well and never left any chunks of debris in the paint as I rolled. One thing that is a must is to use a full face respirator with organic vapor cartridges. At one point while painting I pulled off the mask to scratch my nose and I couldn't believe how bad this stuff smells. There is no question that exposure to this stuff is really bad. All in all I'm pretty happy with the first pass. It's not perfect by any means but it's a start and I think I'll be able to refine my technique as I go along. 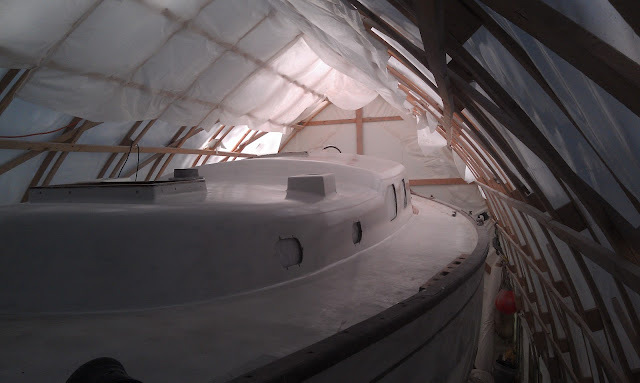 Also, now that the cabintop is fairly uniform in color, I can really see any high and low spots from my work so I'll be able to do a surface fairing after I sand the primer. 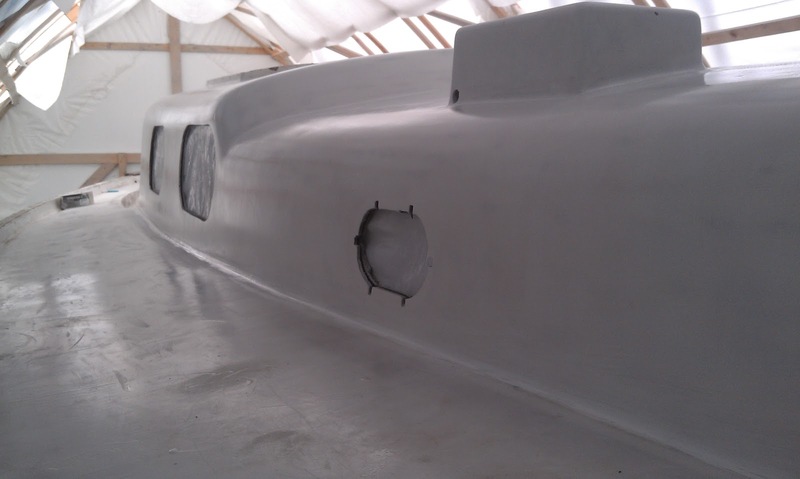 Then I'll get at least one more coat of primer before real paint, but that's a long way off. 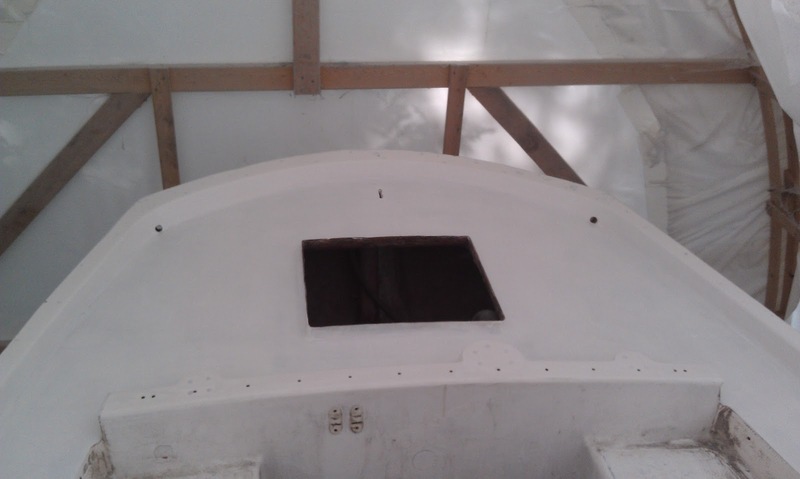 Just the cabintop is primed, decks await.